My TA is visible on the network but not in the TA-software. The TA+ Software is introducing a newly developed Classification Report. 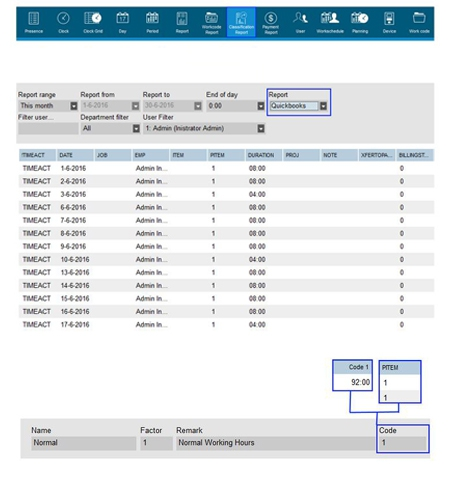 This option is created to create an export file for a certain type of payroll systems. At this moments you can create your own export file where you can export all the data as one line. You also can split the outcome per day. It is also possible to export the data to IIF format ( Quickbooks ). All the fields are predefined as it is stated by Quickbooks itself. The PITEM from the Quickbooks export and Code from the Custom export is linked to the Payclass Rule Code. In the TA Installation Directory there is a file called QuickbooksMap.txt where the Translation from the TA+ Software to Quickbooks is defined.